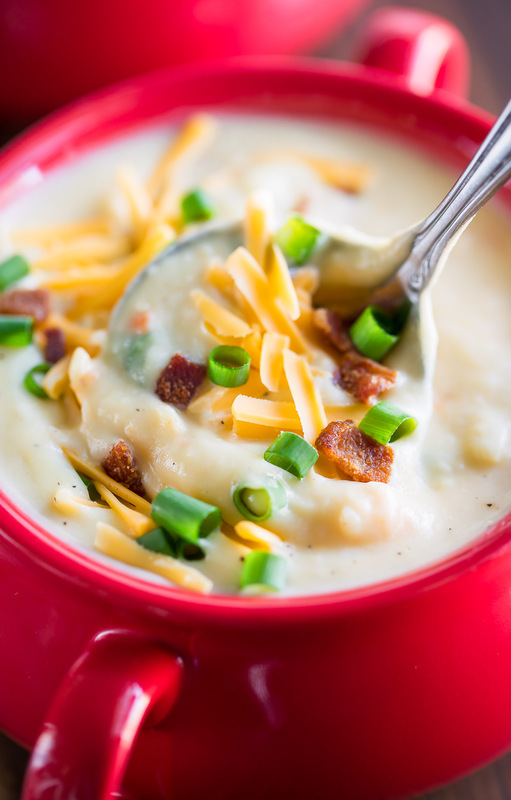 Cozy up with this classic Creamy Potato Soup topped with bacon and cheddar. This easy one-pot soup can be made stove-top or in the slow cooker. Woot! Hi, my name is Jenn and I’m a potato soupaholic. Haha seriously though, I’m obsessed! 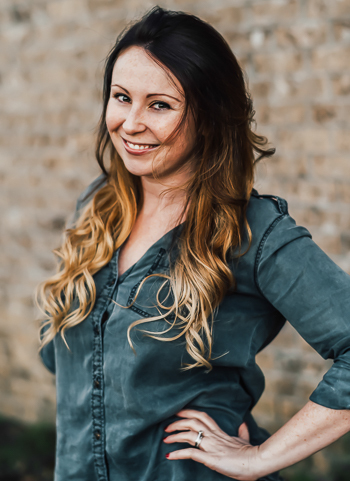 If you’ve poked around this little blog of mine you’ve probably noticed everything from my vegetarian Crock-Pot Veggie Loaded Baked Potato Soup to my Roasted Carrot and Sweet Potato Soup and a zillion other varieties in between. I’ve swirled in pesto and cauliflower and even topped them with crispy baked tater tots because if there’s one thing I love more than potato soup, it’s the TOPPINGS! 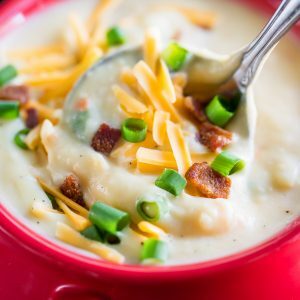 Today’s recipe is more of a back-to-basics approach: creamy potato soup with a few chunks of diced potato kept whole for added texture with a sprinkling of green onion, bacon, and cheddar on top. Add a dollop of sour cream and I’m basically swooning into my bowl with every bite. It’s easy, delicious, and totally crave-worthy. 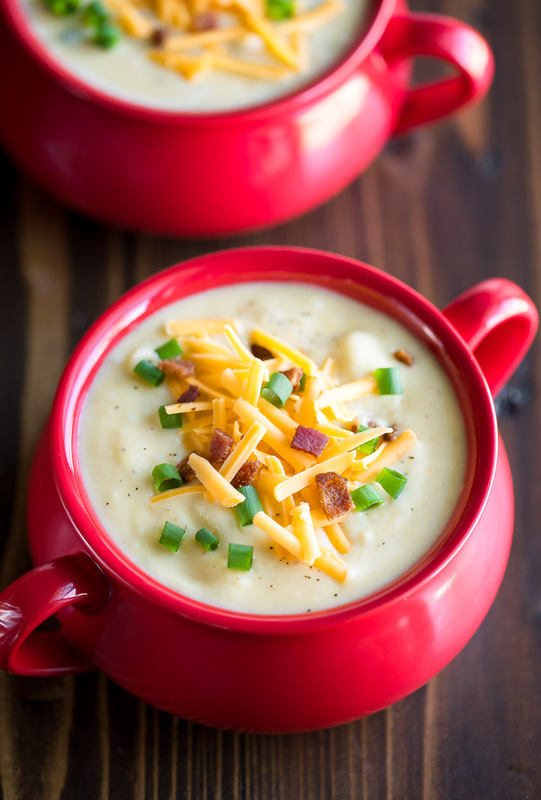 Cozy up with this classic Creamy Potato Soup topped with bacon and cheddar. This easy one-pot soup can also be made stove-top or in the slow cooker. Woot! Wash, peel, and dice your potatoes. Dice onion, mince garlic, and grate your cheese with a box grater. After grating the cheese, grate your carrot using the coarse side of your grater. If you haven't yet, measure out all your ingredients and set them aside for easy soup assembly. Heat the butter in a large pot or dutch oven over medium-high heat. Add the onion and sauté until tender and slightly browned around the edges. Next add carrots and garlic and cook until fragrant, about 1 minute. Season with salt and pepper. Next add your potatoes and broth. Bring to a boil then reduce heat to simmer once boiling. Cover and cook until potatoes are tender, 10-12 minutes. If you're using fresh bacon here (skip for the veggie version) cook in a skillet on med-high heat unit crispy. Drain on paper towels and crumble once cooled. Remove soup from heat, and puree the soup with an immersion blender, leaving some potato chunks in the soup for added texture. In a pinch grab a potato masher and mash partially for an extra chunky potato soup! At this point feel free to add any additional salt and pepper you desire. Add a few TBSP of scallions or chives (I always add some on top and some inside the soup) and stir in your heavy cream. 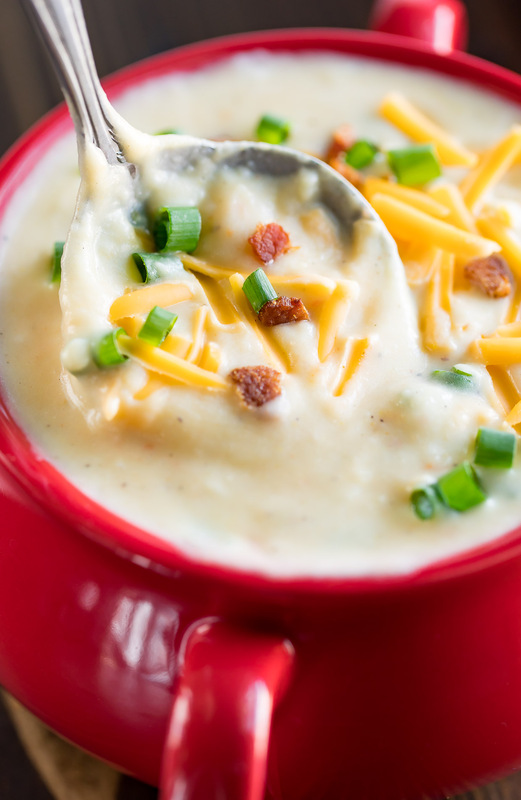 Ladle soup into bowls and top with grated cheddar, bacon (or veggie bacon bits), chopped chives or scallions, sour cream, and any extras your heart desires! Enjoy! This soup is great the first day and stellar the next, so feel free to save yourself a bowl for lunch tomorrow! Freshly grated cheese works best here. It's more flavorful plus pre-shredded cheese tends to be coated and doesn't melt as well. For a thinner soup feel free to add a little extra broth and/or cream then re-season to taste. Easy peasy! For slow cooker instructions, see post below! Wash, peel, and dice your potatoes. Dice onion, mince garlic, and grate your carrot with the coarse side of a box grater. Toss all your veggies in the pot then add broth, garlic, butter, salt, and pepper. Set your slow cooker to HIGH and cook for 4-5 hours, or LOW for 8 hours. For a silky smooth soup, an immersion blender to blend fully, or leave it a bit chunky by only blending about 2/3 of the soup. Ready to eat? Simply mix in your cream and swirl in a few TBSP of chives or scallions into the soup. You can also crisp up some bacon if you’re adding it on top. Taste and re-season as needed, then pile on your choice of toppings and dig in! If you get a chance to try this creamy tomato soup, let me know! Leave some love in the comment form below or tag your photos with @peasandcrayons on Instagram so I can happy dance over your creation! I can’t wait to see what you whip up! This soup is so comforting and delicious, the perfect cozy meal! So glad you’re loving it Wilhelmina, thanks! That soup looks so creamy and delicious! The first thing I did was Pin it to my favorite Pinterest Board! It’s cold and snowy and exactly what we need to warm our bones!